It’s been 46 days, and it’s still alive. Yes, I’m talking about The Streak. Granted, 46 days is nothing compared to my previous streak of 425 days. But this time around, I’m running at least three miles every day. Last time, my minimum was one mile. And those two extra miles make quite a bit of difference. When I was doing one-mile “rest day” runs, I barely broke a sweat, warming up just in time to finish. Three miles, however, is a legit run, requiring appropriate planning and time management. 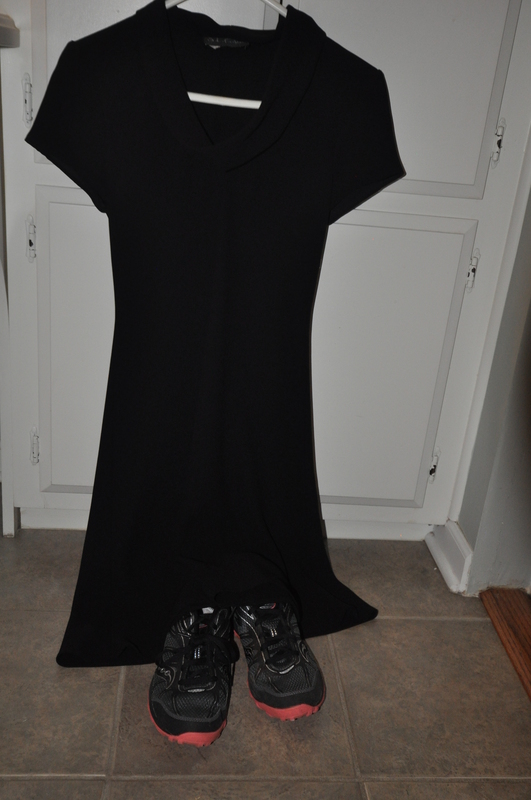 And a three-mile run generates a full outfit’s worth of laundry. Is it a coincidence that my washing machine died a few weeks into this streak? I think not. There’s no question that motivating myself to run three miles is WAY harder. “I’m tired,” or “I don’t have time,” or my favorite, “I’ll go later.” I’ve found myself procrastinating, pushing my runs later and later in the day. However, I’m usually happy by mile 1.5 or so. Still, every now and then I struggle through the whole thing. Fortunately, I like streaking. Forcing myself to run outside every day reminds me that the weather is never really as bad as it seems. After all, once you’re already wet, more rain isn’t a big deal. So the streak is doing well. There is, however, one problem. I’ve got A Little Something going on in my foot. Now, before all you crabbypants out there start saying “See! I told you! Streaking is BAD,” let me clarify that the Little Something in the foot pre-dates the streak. In fact, I developed foot pain a few weeks after my last streak ended. And while I agree with those who say that rest is important, I also believe in consistency – not to the point of overuse, but I believe the body adapts to whatever it routinely encounters. It was when my running became more sporadic that the Little Something in my foot arrived. 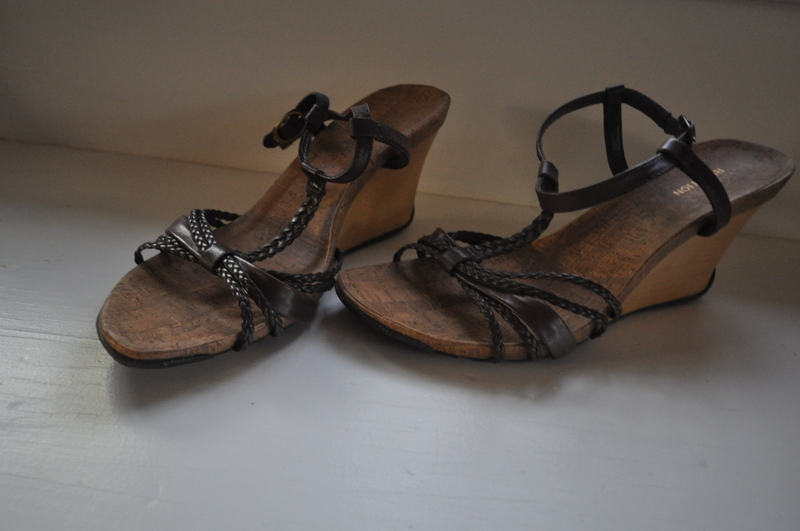 Spring has arrived, and the strappy sandals have been dragged out and dusted off. But whatever is going on in my foot doesn’t seem to like the fancy footwear. 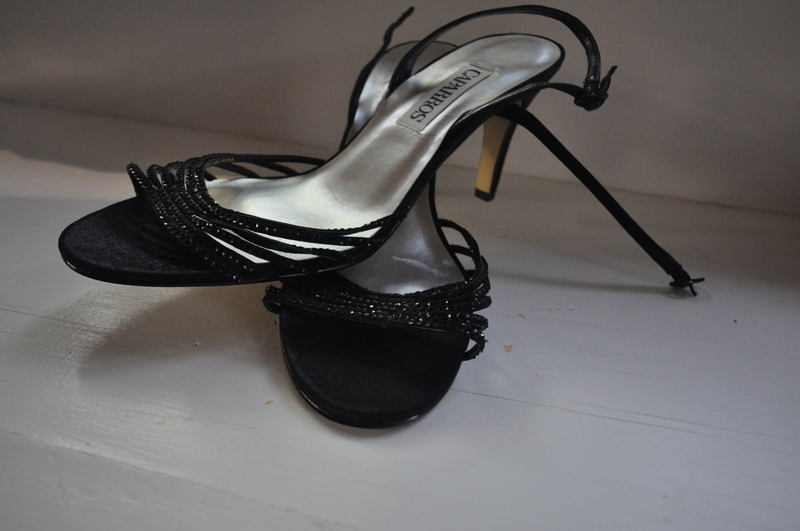 My feet prefer Kinvaras, and last I checked, Saucony doesn’t make dressy heels. So what’s a gal with foot pain to do? I think the solution is for me to start wearing my running shoes all the time, regardless of the occasion. Fortunately, I have running shoes in an array of colors, so I can coordinate with just about any outfit. 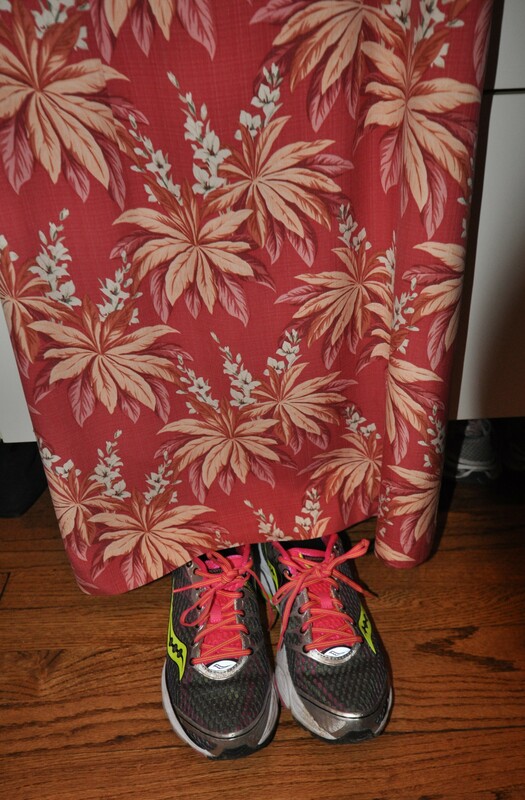 For example, see how nicely these Saucony Triumphs match the floral pattern in this sundress. 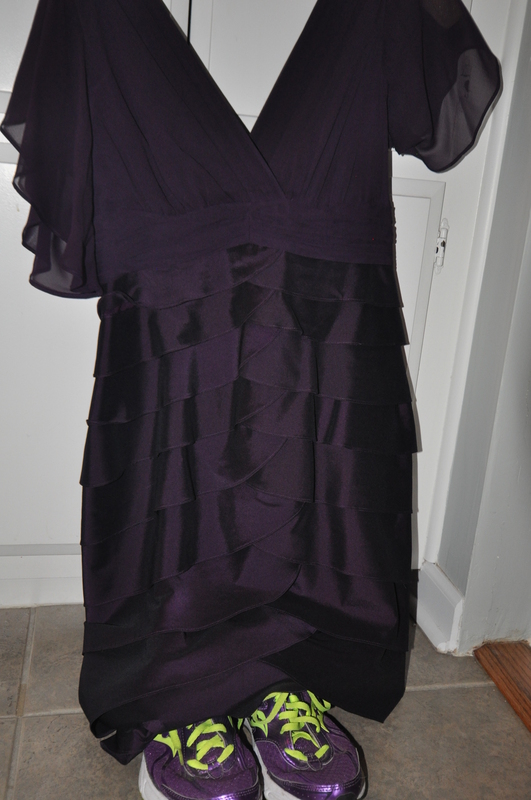 This purple cocktail dress works well with my Saucony FastTwitch. Even for a somber occasion like a funeral, I have my trail runners, which are a nice shade of gray. I know there will be critics: “Don’t look Ethel! 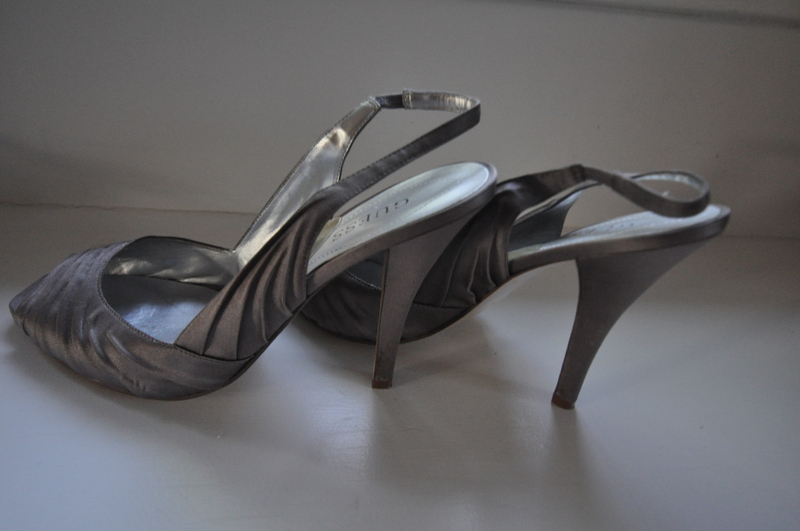 That lady is wearing sneakers to a formal wedding!” But maybe I can start a new trend. After all, with so many great color choices these days, running shoes shouldn’t be just for running anymore. Now I just need to pick out the right socks. Perfect! And in neutral black and white, no less. Your streaks makes the blackhawks’ streak seem like child’s play! keep it up! I like your comment about running in the rain! I find it freeing.. minus the drying process for the kicks after! Do you throw your running kit in the shower with you after the run to reduce the amount of times you have to wash it? I’m going to miss you, Sue!!!!!!! Don’t leave me!